One of the monitors in the East Antarctic seismic array. If there’s a final frontier on the surface of our planet, it’s East Antarctica, a vast region of largely-unexplored mountains and canyons covered in a mantle of ice thousands of feet thick. The latest indication of how little we know about East Antarctica? We basically just learned it’s seismically active. Until now, exactly nine seismic events had been recorded across all of East Antarctica, beginning in 1982. The largest, coldest, and seemingly most stable of Antarctica’s three major sections (the two other sections are West Antarctica and the Antarctic Peninsula), East Antarctica’s geologic lethargy had been attributed to low levels of tectonic stress and the prodigious weight of the overlying ice sheet. But the real explanation is apparently far simpler. “It’s really just we didn’t have the ability to fully observe what’s going on,” Drexel University seismologist Amanda Lough told Earther. Lough’s latest research, published this week in Nature Geoscience, confirms as much by tripling the number of recorded seismic events in East Antarctica. Following the installation of a seismic array in the ice sheet’s remote interior, 27 small quakes—ranging in size from magnitude 2.1 to 3.9—were recorded in 2009. Most of these quakes occurred in basins near the Gumburtsev Subglacial Mountains, believed to be part of an ancient rift system where Earth’s continental crust is being pulled apart. East Antarctica is an old, stable continental landmass that geologists call a craton. Most cratons, such as the Canadian Shield that stretches across much of Canada, feature seismic activity, which made it a bit of a puzzle why East Antarctic didn’t, according to NASA cryosphere scientist Thomas Wagner. The new findings put East Antarctica more in line with its cratonic brethren. “The seismic ‘quietness’ of the past required some explanations that we can likely retire,” Wagner told Earther via email. It’s the latest evidence that we’re just scratching the surface of what lies beneath Antarctica’s thickest ice. Just last week, Earther reported on a separate study that revealed three monstrous canyons lurking beneath the South Pole, a finding that could shape our understanding of how ice in East and West Antarctica will change as the planet warms up. Lough said East Antarctica’s newfound seismic activity won’t have much bearing on the overlying ice’s future stability. Instead, the discovery will inform our understanding of the geologic history of Antarctica and its behavior as a tectonic plate. Indeed, the biggest story of all here may be the fact that these measurements happened at all. 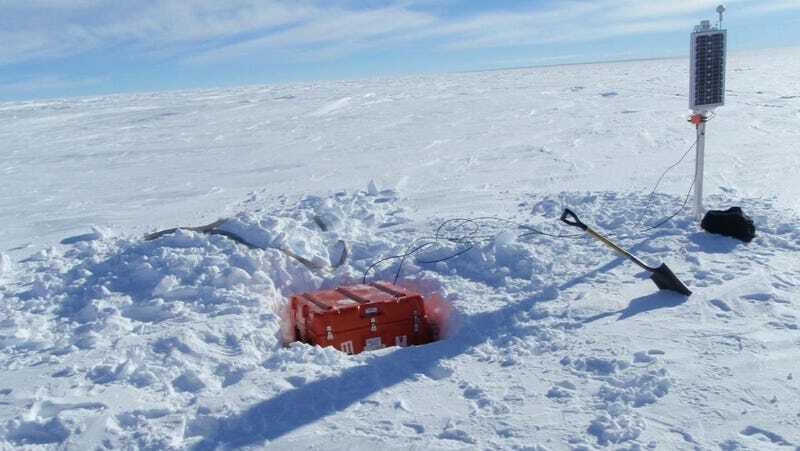 The researchers traveled to one of the most inaccessible parts of East Antarctica via aircraft to deploy equipment that ran on lithium batteries throughout the dark and brutally cold winter. Miraculously, it worked.